Toronto pop minimalists Born Ruffians have already released their track "Nova-Leigh" in two different forms this year: first on their sophomore LP, Say It, and then in remixed form on the new Plinky Plonk EP. Now, the band are releasing the track as a single, complete with a new music video. 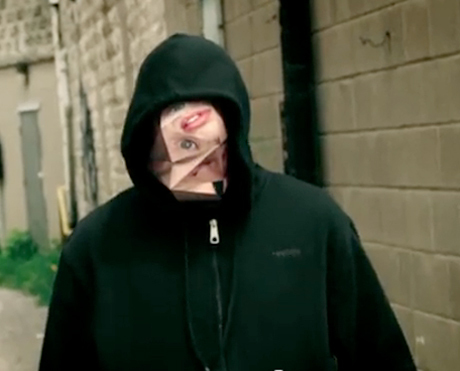 The clip was directed by Jared Raab, who modelled the video after the fragmented faces seen on the Say It album cover. Showing a hooded figure with his facial figures rearranged, it was made with a mix of masks and CGI. The clips of the band performing are similarly warped. "In the end we devised a system of shooting into shattered mirrors that had been reassembled by hand," explained Raab in a statement. "We spent an entire day just breaking mirrors and gluing them back together, only to smash them again on set." See the fruits of their labours below. Say It is out now via Paper Bag/Warp, and Plinky Plonk is currently available digitally and at shows.